I took the train from Basel to The Hague, with a few brief stopovers, between 5 and 8 October 1995. At the time, I was reading some texts by Vilém Flusser on the philosophy of photography and the emergent use of technical images. Wishing to put certain theoretical assertions or insights to the text of personal experience, I bought along a Nikon AF automatic camera and a roll of black and white film. I was interested in exploring my own cursory ways of seeing during the journey, and the role played by the camera. The images in this series are printed chronologically and no selection has been made. The last three seascapes are from a roll of colour film I started in The Hague, and these create an immobile conclusion to the series. The three extra photos just happened to be on a film that was still in the camera for a different project. 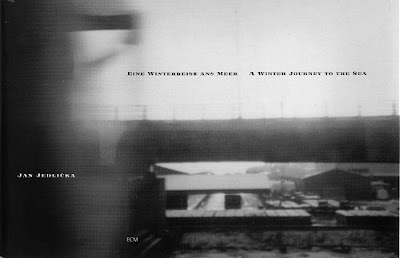 Those words come from A Winter's Journey To The Sea, seen in my header image, which was published by ECM in 1996. This slim volume of photos by the Czech photographer Jan Jedlička came into my hands completely by chance. Our son had been trying for several months to buy ECM's new book Windfall Light for me as a present. It is somewhat elusive so he finally ordered a copy from ECM in Munich. The book arrived from Germany in a parcel into which a kindly elf in Santa's Munich grotto had added the 2009/10 ECM catalogue and A Winter's Journey To The Sea. Jan Jedlička's photo essay may have been created fourteen years ago. But his words 'no selection has been made' may just be the catchphrase of this new decade. Ever since Hildegard penned her Ordo Virtutum the volume of content being created has exceeded distribution opportunities for that content. The balancing mechanism between creation and distribution has always been selection, and the mechanisms of selection (and the control of those mechanisms) have pretty well dictated the development of the performing arts for more than a millenium. But due to leaps in digital technology and the internet we are approaching the tipping point where the distribution opportunity will equal or exceed content. When we reach that point will text and image based search and selection tools be gridlocked by the proliferation of music content? Will more than 10 million iPod Shuffle users worldwide mean shuffle replaces selection? Will the speakers on our computers become the audio equivalent of a digital photo frame endlessly cycling through random content streams? Will musical versions of William Burrough's cut-ups become a new art form? Will conventional broadcasters such as the BBC, whose whole business model is based on selection, join record companies as an extenct species? In the new decade will the switch to less highly finished content as presaged by the boom in CDs made from live concert performances accelerate? Will using Pro Tools become politically incorrect? Will we explore Twitter for music? Will 'no selection' mean conventional concerts are replaced by open rehearsals and play throughs and artistic residencies with audiences present? Will 'work in progress' become a new artistic currency? Will scratch orchestras, as pioneered by Cornelius Cardew, be the new YouTube orchestras? Will Schubert's Unfinished Symphony be the new anthem? Or will it be John Cage's Radio Music for chance tuned wirelesses? Let's make one thing clear. This is not a doomsday scenario. If age has taught me one thing it is to constantly challenge my own preconceptions. Quality and quantity are not mutually exclusive. Quantity simply brings new qualities and one of them is chance. Which is how this post came to be written. "Will musical versions of William Burrough's cut-ups become a new art form?" err. you mean like the last 25 years of hip hop maybe?